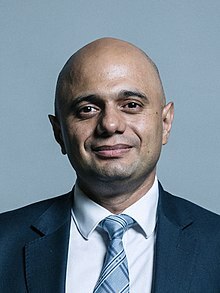 Sajid Javid (born 5 December 1969) is a British politician and former managing director at Deutsche Bank. A member of the Conservative Party, he was appointed Home Secretary on 30 April 2018. He has been the Member of Parliament (MP) for Bromsgrove in Worcestershire since the general election of 2010. My own family's heritage is Muslim. Myself and my four brothers were brought up to believe in God, but I do not practise any religion. My wife is a practising Christian and the only religion practised in my house is Christianity. Addressing a church-hosted husting in his inaugural election campaign for Bromsgrove on 22 April 2010, in Versi, Ahmed (29 June 2018). "Home Secretary Javid hits back at those questioning his faith". Muslims News. Retrieved on 7 October 2018. Farley, Harry (30 April 2018). "Sajid Javid: What has the new home secretary said about faith?". Christian Today. Retrieved on 30 April 2018. Sajid Javid is a true champion of our cause. We cannot thank him enough for all he has done to support Holocaust remembrance – including his strong leadership in the development of the National Holocaust Memorial and Learning Centre to be built next to Parliament, as well as his recent commitment to fight antisemitism on university campuses. Sajid Javid is held with huge affection by Holocaust survivors and the wider community – we wish him all the best in his new role and thank him for all he has done. In 2018, Karen Pollock, chief executive of the Holocaust Educational Trust, in Rocker, Simon (30 April 2018). "New Home Secretary Sajid Javid addressed Jewish community from pulpit on Shabbat". The Jewish Chronicle. Retrieved on 21 May 2018. This page was last edited on 10 February 2019, at 12:58.